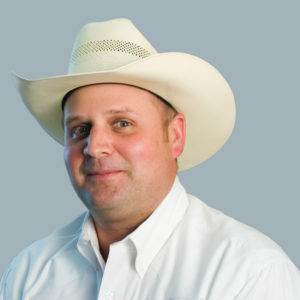 Ge orge Chambers is a sixth generation independent cattleman from Bowdon, Ga. He, his wife Candi and children Kaleb and Taylor run a 600 head cow calf operation, the Southern Cross Ranch. George is the 3rd District State Director for the Georgia Farm Bureau and sits on the State Board of Directors. He has been a member of the State Young Farmer Committee, the Finance Committee, and a very successful Legislative Committee. As a member of the Bureau’s Policy Development Committee, George wrote and helped to pass into policy key wording to support R-CALF USA’s position on mandatory COOL, a ban on packer ownership and supportive wording to promote competitive market practices in the beef industry. George has testified on behalf of R-CALF USA at recent 2006 Farm Bill Hearings and has lobbied in Washington to support the organization’s position. George is a graduate of Berry College (1994) with a BS in Reproductive Physiology and a minor in Animal Breeding. He and his family are active members of many civic and fraternal organizations as well as active members of Victory Methodist Church.